Disclosure: I received a free copy of this book from the University of Chicago Press. I have a terrible editor confession:1You can choose to read that either as a terrible confession for an editor or as the confession of a terrible editor. until now, I had not read Carol Fisher Saller’s book The Subversive Copy Editor. I also have to take back what I said about But Can I Start a Sentence with “But”?—this is the best book on editing I’ve ever read. The book, now in its second edition, has been revised and expanded with new chapters. 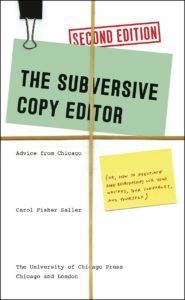 In the introduction, Saller explains just what she means by “subversive”—rather than sneaking errors into print to sabotage the writer, she aims to subvert the stereotype of the editor locked in an eternal struggle with the writer or so bound by pointless rules that they can’t see the forest of the copy for the trees of supposed errors. I find Saller’s views on editing absolutely refreshing. I’ve never been a fan of the idea that editors and authors are mortal enemies locked in an eternal struggle. Authors want to share their ideas, and readers, we hope, want to read them; editors help facilitate the exchange. Shouldn’t we all be on the same side? Saller starts with a few important reminders—copy editors aren’t the boss, and the copy doesn’t belong to us—before diving into some practical advice on how to establish good author-editor relations. It all starts with an introductory phone call or email, which is the editor’s chance to establish their carefulness, transparency, and flexibility. If you show the author from the beginning that you’re on their side, the project should get off to a good start. And to maintain good relations throughout a project, it’s important to keep showing that you’re careful, transparent, and flexible. Don’t bombard the author with too many queries about things that they don’t know or care about like arbitrary points of style. Just make a decision, explain it succinctly if you feel the need, and move on. And don’t lecture or condescend in your queries either. Saller recommends reading through all of your queries again once you get to the end of a project, because sometimes you read a query you wrote days ago and realize you unintentionally come across as a bit of a jerk. And Saller doesn’t have much patience for editors who get “hung up on phantom issues and personal bugaboos,” who feel compelled to “ferret out every last which and change it to that”2I saw this happen once on a proofread. Remarkably, I don’t think the author used a single relative that in the entire book. The proofreader hunted down every last restrictive which and changed it to that—and missed a lot of real errors in the process. And changing that many whiches to thats surely would have wreaked havoc with the copyfitting.—if you’re still relying on your high school English teacher’s lectures on grammar, you need to get with the times. Get some good (current!) reference books. Learn to look things up online. I also appreciated the advice on how to manage difficult projects. When faced with a seemingly insurmountable task, Saller recommends a few simple steps: automate, delegate, reevaluate, and accept your fate. See if you can find a macro or other software tool to save you from having to grind through long, repetitive tasks. Delegate things to an intern if possible. (Sorry, interns!) Ask yourself whether you really need to do what you think needs to be done. And if all else fails, simply knuckle down and get through it. Whether you’re a seasoned editor or a novice just breaking into the field, The Subversive Copy Editor provides sage advice on just about every aspect of the job. It should be a part of every editor’s library. The Subversive Copy Editor is available now at Amazon and other booksellers. 1. ↑ You can choose to read that either as a terrible confession for an editor or as the confession of a terrible editor. 2. ↑ I saw this happen once on a proofread. Remarkably, I don’t think the author used a single relative that in the entire book. The proofreader hunted down every last restrictive which and changed it to that—and missed a lot of real errors in the process. And changing that many whiches to thats surely would have wreaked havoc with the copyfitting.